This week’s FF prompt shows that many writers are multi-talented. 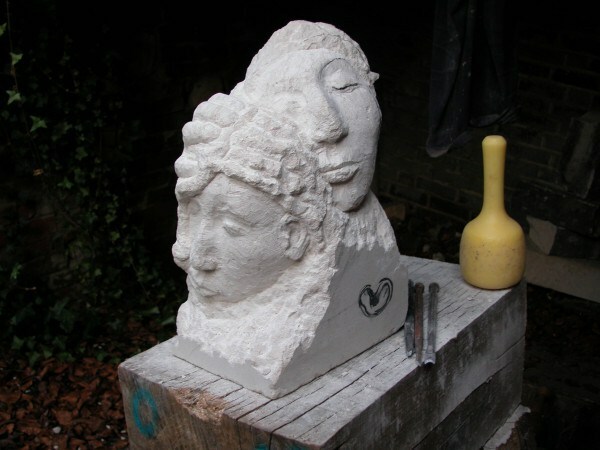 Claire Fuller’s photo is of her own sculpture. As ever, other responses can be found through Rochelle’s site. For me, this one was a bit of a challenge. I had this idea, but I couldn’t think of a way to squash it down to anything like 100 words. It felt like a whole novel. The muse also kept shouting “Cicero”, which is not helpful. Cicero’s story is completely unconnected to the one I wanted to tell, and I couldn’t spare any words on incorporating it, or even on adding a cat called Cicero (Don’t you think it’s a brilliant name for a cat?). So the editing process was a lot less smooth this week, as those who read the previous drafts will see. I had also challenged myself this week to try to go back to my roots and make this more of a story and less a description, which I feel like the last few have been veering towards. AND I wanted to see what I could do with Rochelle’s motto that the picture is “inspiration not illustration”. Lots of ambitions; I’d love to hear if you think I met any of them! Lois dropped the chisel into the sink and ran the taps. Warm water flowed over her skin, revealing the fingerprint bruises and historic scars which mottled her arms. Her latest work, the two-faced man, lay on the work-bench. Cold and lifeless. It was a grotesque vision – too many mouths, slashed into pale white; too many unseeing eyes staring at her. As a sculptor, she knew that the work of a chisel could never be changed or undone, but this time she felt no remorse. There had been no mistake. And blood, she found, washed off more easily than plaster dust. Lois peeled dusty sleeves from her arms, revealing fingerprint bruises and peeling scabs. She hardly looked at them, concentrating instead on scrubbing at her hands. Warm water rushed into the sink, washing away the fine white powder which had coated her fingers. Lois dropped the chisel into the sink and ran the taps. Warm water flowed over her skin, revealing again the fingerprint bruises and historic scars which mottled her arms. A sculptor, she knew that the work of a chisel could never be changed or undone, but this time she felt no remorse, no mistake. And blood, it turned out, washes off more easily than plaster dust. Lois dropped the chisel into the sink and ran the taps. Warm water flowed over her skin, revealing again the fingerprint bruises and historic scars which mottled her arms. Her latest work, the two-faced man, lay on the work-bench. It was a grotesque vision – too many wide laughing mouths, slashed into pale white. Cold and lifeless. A sculptor, she knew that the work of a chisel could never be changed or undone, but this time she felt no remorse, no mistake. And blood, it turned out, washes off more easily than plaster dust. [At 93 words, this was close to what I wanted, but a few places weren’t quite right. The changes from this to the final version reflect a few added words – in particular the addition of the eyes and making “no mistake” into a sentence of its own – but also polishing of the image. The idea that the mouths were “laughing” seemed incongruous unless the man is still mocking her, and there wasn’t space to show that to my satisfaction so I ditched it. Washes became washed – there is a grammatical argument for either, but I preferred the latter in the end because it felt less like the author creeping in.